I have over time become a huge fan of Jen Lancaster. Her humor is definitely sarcastic and may not be for everyone, but it's definitely worth a try. In this book, she details her life through school and her early jobs - revisiting the 80s - how fun! Laugh out loud parts? Oh yeah. 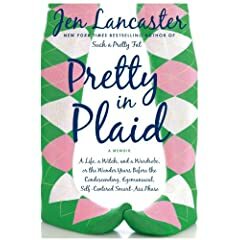 This was the first Jen Lancaster book I read, and I loved it. I then jumped into Bitter is the New Black, but I like this one better.